Watch spectacular fireworks displays for Guy Fawkes’ Night in London this year! As I write this I can hear the occasional “crack!”, “pop!” and “wheeee!” of fireworks. Is that autumnal fog I see drifting over the lawn towards me? Nope. It’s the smoke from said fireworks. And what of the glorious colours that paint the heavens? Have the Northern Lighst magically appeared well south of the Arctic Circle? Nah. It’s those fireworks again. So what precisely is going on? Well, most nations on earth seem to find room in their calendars for an opportunity to show exactly what happens when you combine fire, sulphur, saltpetre, and charcoal with a willing crowd of people ready to go “Oooooh!” at the results. It’s jollier than you might initially think. The Chinese have been doing it for a couple of thousand years already. In the US, the 4 th of July is the day for some spectacular displays of sparkly marvelousness. If you’re staying in one of the vacation rentals in Venice from our sister company Italy Perfect during July, you can enjoy the Festa della Redentore with some impressive rockets and whizzers over San Marco. Meanwhile, for much of Continental Europe and the Antipodes, New Year’s Eve is when it all gets very exciting. In England our big fireworks bonanza is November 5th, affectionately known as “Bonfire Night”. However, rather than celebrating Independence from a colonial oppressor (technically, we never really got rid of the Normans after 1066), thanking God for saving our city state from Plague or welcoming in the New Year, we launch fireworks to commemorate the thwarting of a terrorist attack. In 1605 these fair isles were ruled by King James I. The first Scottish monarch of England and proud protestant, James was keen to stamp out all traces of Catholicism in his kingdom. Personal paranoia, international politics as well as theology (consubstantiation versus transubstantiation anyone?) all played their part in this policy. Needless to say this stance irked those English who were practicing – usually in secret or abroad – Catholics. In 1604 a group of extremely irked “left-footers” got together and hatched the decidedly un-Christian plot to blow up the Houses of Parliament with King James I inside. All was going smoothly. The conspirators managed to lease an undercroft situated beneath the Houses of Parliament. Over the summer of 1605 they gradually filled it up with barrels of gunpowder in anticipation of the opening of the new parliamentary session on November 5th. Unfortunately for the plotters, word leaked out and in the early hours of that morning soldiers raided the undercroft. Amongst the gunpowder they found one of the group, Guy Fawkes, the man who would have lit the fuse and set England upon a very different historical course if the plot had been successful. 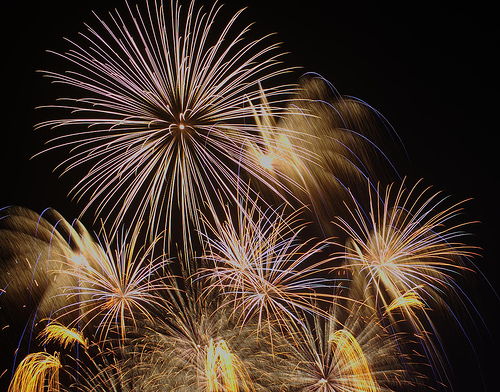 Join in the fun events and see the fireworks on Bonfire Night in London! As this all happened in the Early Modern period, when things like “human rights”, the “dignity of man” or the “Geneva Convention” didn’t have any currency, it possibly comes as no surprise that Fawkes came to a tortured end. 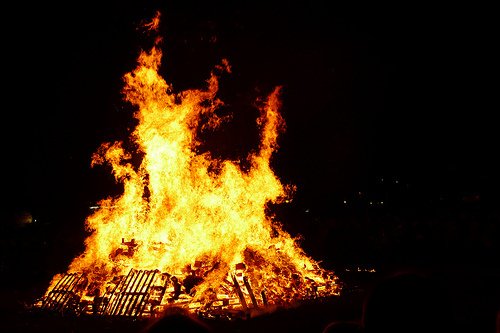 Bonfire night is thus the annual commemoration of what might have been and as a collectively subconscious way of defining the nation’s Protestantism. For almost four hundred years in the run up to November 5th, children would make an effigy of Fawkes out of old clothes, straw or other flammable materials. Said children would then take the effigy around the local community, plaintively requesting “a penny for the Guy”. Quite what happened to said pennies is unclear, but I like to think it went to some sort of charitable organisation rather than sweets or cakes. Ultimately, said “Guy” would then be placed upon the Bonfire on November 5th and burnt whilst fireworks lit up the sky. Today, fewer and fewer “Guys” make an appearance at Bonfire Night. Is this either because of the burning of a Catholic in effigy rightly makes one feel uncomfortable or is it simply that people are forgetting their history as they’re dazzled by the colours and light of a thousand Catherine Wheels, Roman Candles and sparklers? Posted on Sunday, November 4th, 2012 at 4:50 pm in What's On. You can follow any responses to this entry through the RSS 2.0 feed. You can leave a response, or trackback from your own site.